Signing Rondon for next season if we stay up is a must but I think there’ll be a lot of clubs looking at him, he’s a managers dream of a striker. On Tonight’s game, I think Rafa might save Almiron until the 2nd half to give him time to see the way we’re playing but who knows. I think the Wolves lads will be out to try and rough him up so hopefully he can deal with it and express himself. Either way he’s going to take time to adapt and I wish him the best of luck, he looks a cracking player. Some of his highlights for Lanus are brilliant and that league is very rough so I’m sure he’ll quickly get used to the physicality of the Premier league. We were robbed against this Wolves team last time (they seem to get away with everything) so hopefully the lads can get some revenge tonight. I understand the club were talking to West Brom about Rondon and a permanent deal during the January window, but that it was too complicated to get over the line. I can understand that, it would require agreement on the valuation of at least two players (Gondon and Gayle, maybe Murphy also), agreement on a payment schedule, promotion and relegation clauses and then the mundane details like agents’ fees, player wages and other things. Too complicated to get over the line in the last 48 hours of the window, fair enough. That said, surely the clubs could have started talking about it at the start of the window or even have an ongoing dialogue around it since September? Surely it’s crossed the minds of someone at each club? Almiron no pressure bud, just do your thing man. Simon i believe it was mentioned at the time that the loan deal doesnt have a buy agreement in it. WBA have extend his contract by a year so hes got one year to run after this loan deal is over. Tbh simon i dont no am just going off that merino had a buy clause after a certain amount of games i think. Dubz had one also. Think its been mentioned that the new lb has a buyout if we are interested. Jib can it not be both depending on the deal? The signing of Almiron could not be completed sooner due to the delay in the Atlanta purchase of Pity Martinez but the Rondon deal could and should have been completed sooner when it became clear there was an option to do it. simon, I believe we can sign him at any point during his loan, however, the formal transfer or registration does not change until the window is open. We just don’t have any pre-aranged agreements with WBA over this. I expect they would not let us sign him now unless we offer crazy money anyway, as technically the more games he gets for us, the more likely other clubs will enter for him nearer the Summer months. of information is doing their heads in. The club will have an idea of what they want to pay for Rondon and what they want to sell Gayle for. If West Brom move the goalposts on Rondon, we can be difficult over Gayle. It would be sensible to sort out a deal which suits everyone equally. 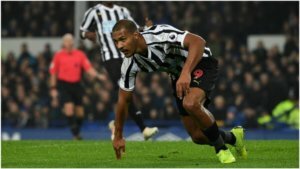 Got to think that if West Brom fail to get promoted (and I think they might just miss out) then swapping Gayle for Rondon might become a priority for them as he’s lethal at that level as shown again this year! I’m looking forward to the match tonight. I imagine our London-based support and our travelling Mags will raise the roof and create a great atmosphere. Rafa has some interesting new tactical options at his disposal, based around the new additions to the squad and this will make Watford’s tactical choices difficult for them. Cmon you’re better than that….you know fine well that MASH holdings was / is not the NUFC purchase vehicle. St James Holdings (incorporated 21st May 2007) has always been the holding company for the club. Going to the game tonight! Should be decent, Wolves play some good stuff! Got a few mates who are Wolves fans and they reckon Newcastles set up is exactly the type of side they really struggle against as they like to counter and play expansively and struggle against teams with solid rigid set ups so it should tactically be an interesting one! Hopefully see a bit of Almiron at some point too! Guessing we’ll stick with the 3-4-2-1 (would hope so anyway), interested to see if Barecca starts as hes had a full week of training and offers alot more than Ritchie at left wing back and would allow for Ritchie to play further up. First time really this season Rafas had some big selection headaches as really we’ve 18 players that all probably have a decent shout at being in the first 11…. MA’s company equivalent of the Ali shuffle. Wolves seem to have it right up to now like. Looking to expand the stadium. They want to invest in the youth setup. Soon our big stadium will just be common place to all the “lower” teams. If ashley doesnt act now or sell Newcastle is just going to settle into medicorasy for ever. Tubbs just run our football club properly man. Bit of a lift for the lads. The new lads take the pressure ( workload) off our boys. Its not about being replaced everyone is here to do a job, people should be fresher. Less scare of an injury crisis less anxiety for the lads. Hopefully a bit more creativity uptop. Get more to rondon more goals. Saftey in sights. Jay youve raised some interesting points there like. If WBA dont get promoted a straight swap between the two would suit both parties in my opinion. I like gayle and as a sub ,3rd striker is not too shabby. But maybe muto is gayles replacement. Also hopefully the neets game is an interesting one like you say but in favour of the toon. Jib/Jane – please stop with the Companies House stuff – you have previously shown your complete misunderstanding of it – so much so you are the blogs Companies House Goon. You are not the blog anchor you profess to be. Although if that word began with a wubbleyou it would be you. Honestly think if he gets an offer from China or the like he’ll be off… and Id be shocked if after this season theres not a few in for him! Should of signed him in the summer. If he keeps us up for 2 seasons 16 mill is a snip and hes done a job. Almiron tonight will be interesting… no idea how fit he is but if hes close hes a long way ahead of Perez and Atsu in terms of ability and both of them have ran themselves into the ground for the cause the last 4 weeks! Similarly, Diame and Ki back, it’ll be interesting to see who starts in midfield…neither longstaff nor Hayden deserves to lose out but then coldly and clinically speaking, you’d probably say Ki and Diame are slightly ahead of the 2 young lads.. personally i’d love to see Longstaff and Diame tonight! Left back will be interesting… is Dummett back? Ritchie has worked his socks off but never looked particularly comfortable there whereas Beracca is essentially a Yedlin clone, designed perfectly for a wing back role… but in a shape thats been so successful, 3-4-2-1 where exactly does Ritchie fit in? Another interesting one is Kenedy…. with Diame, Ki, Muto, Almiron, Possibly Dummett being added to the squad from last week, does Kenedy even make the bench? I don’t think Miggy will have any trouble adapting to the PL. Look how many Championship players do it when promoted and he’s well better than that. He survived the Argentinian League intact which physicality wise, is every bit a tough – and probably rougher. And let’s not think the MLS is that bad. It’s improved massively in a very short time and we can expect a lot more players to take the sane route Miggy has in the future. Never let size be an issue. He has a wiry strength and from I’ve seen, an ability to ride a tackle and shrug off players trying to hold him back. And if they really insist on bringing him down in full flight, he takes a mean free kick. Although I expect him to start on the bench, I wouldn’t be in the slightest bit surprised if he started, listening to what Rafa’s been saying. I think a real boost to the team would be the signing of Rafa. If only we had a proper sports owner. He claims he loves sports. Imagine if that Leicester owner had of rocked up on our shores. My god he would of loved beyond belief. Imagine if he had of won the league for the toon instead. Na better off with the devil we know eh? From reading Rafas comments he says miggy is ready to go. So will be interesting to see the team the night. @bobbybee – the Argentinian league is closer to MMA than football… And the MLS is more athletic than the premier league, I think he’ll adapt very quick! Hes absolutely terrorized otamendi and co for Paraguay too! My only fear for Almiron is the speed he makes decisions at… the MLS is technically and tactically quite poor, I think thats probably his weakness, it’s probably why they weren’t really open to playing in Italy because it would have been a bigger problem there, think we might see a few occasions where he chooses the wrong pass or to run or shoot etc as he’ll get less time on the ball than he’s used to! I know there is still alot of work to do around the squad. Buts its nice have cover for positions. Not having to play players out of position. Beracca and yeds bombing the wings, is such an exciting prospect like. Only seen a glimpse but a reckon he looks rapid mate. A hope so. Al hold me hands up only seen him play in that short 10 min spell or so he had. Again with miggy never saw him play only a couple clips, hope both rock it for us.